Change the way you Think about losing weight and shrink your waistline. Not consistently getting a good nights sleep. 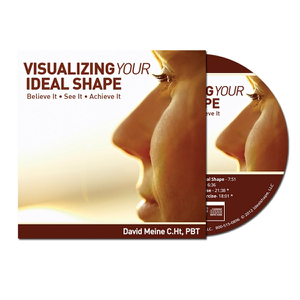 Not being able to visualize your ideal shape. Allowing sabotage from yourself and others. Eating until or past full. Eating and drinking too much sugar. What really dictates our behavior? The brain has incredible power to shape our choices, and in turn, our bodies. Much of this process happens beyond our conscious awareness. The creators of most weight loss plans are experts in nutrition and exercise physiology with wonderful insights into the human body, but they do not necessarily understand how the mind works. If your brain is not engaged in creating your ideal shape, any weight you lose will eventually come back — plus a few more pounds. The internal mental processes that guide our choices and actions can be very complicated. In fact, scientists believe that up to 8o% of our thoughts and actions are dictated at the subconscious level. This is why it’s so important to program your mind to work with you toward your health goals, at all levels of consciousness. Why are diets/exercise regimens so hard to stick to? Motivational Brain Training for weight loss uses visualization, repetition, reinforcement, stress reduction and relaxation techniques to help you become open to new, positive thoughts and ideas. These same techniques are used by psychologists, teachers, marketers, and company leaders everywhere. It’s time we start using these powerful techniques to achieve our most important goal: creating a happy, healthy life. When it comes to creating a paradigm shift in our minds, it’s important to stay positive and keep from feeling overloaded. David has found that all it takes to make a new habit permanent is 28 days of consistent repetition. His unique approach focuses on changing one negative behavior at a time, which allows you to feel calm and focused as you program the new behavior. Once you’ve mastered the first behavior, you’ll be ready to move onto the next, until you have programmed all 10 positive behaviors and created an unshakeable foundation for lifelong health and fitness! Why do we sometimes feel “out of control"? Put simply, there’s a lot going on behind the scenes in your life! Shrinking your waistline and taking control starts with understanding the 10 negative behaviors that are holding you back from achieving your ideal shape. 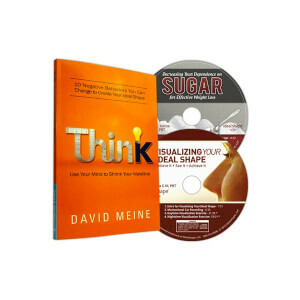 In Think: Use Your Mind to Shrink Your Waistline, motivational brain trainer David Meine teaches you how to program your brain to overcome negative behaviors that prevent you from losing weight and keeping if off. 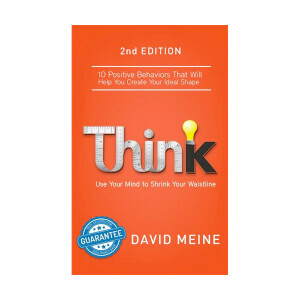 Let David be your personal brain trainer in Think. Learn from real life stories as you discover what’s holding you back from achieving your ideal shape and how you can reprogram your mind to create the body you want. Get the special offer now!